All the candidates who had appeared in 8th class annual examination 2019 have been waiting for their result impatiently so that they can seek admission for further studies. So the good news for all those students is that the officially authority of Punjab Examination Commission (PEC) has announced that the PEC 8th class result of all Punjab districts will be declared at 10:00 am in 31st March 2019. In order to make the 8th class result checking process more easy and convenient for all visitors, we will be providing the complete result of all 36 districts of Punjab through our website. The result will be available here immediately after its declaration of PEC and students will be able to check their result by just entering required information like Complete Name, Roll Number, Institute Name and District Name. One of the key responsibilities of Punjab Education Commission (PEC) is to conduct the annual examinations of 5th and 8th class in a fair and transparent manner in all districts of Punjab. There are currently 36 districts in the province of Punjab which are Lahore, Gujrat, Multan, Sargodha, Sheikhupura, Faisalabad, Toba Tek Singh, Vehari, Chiniot, Dera Ghazi Khan, Attock, Bahawalnagar, Bahawalpur, Rahim Yar Khan, Rajanpur, Rawalpindi, Bhakkar, Chakwal, Gujranwala, Hafizabad, Jhang, Jhelum, Kasur, Khanewal, Khushab, Sahiwal, Layyah, Lodhran, Mandi Bahauddin, Mianwali, Okara, Pakpattan, Sialkot, Muzaffargarh, Narowal and Nankana Sahib. 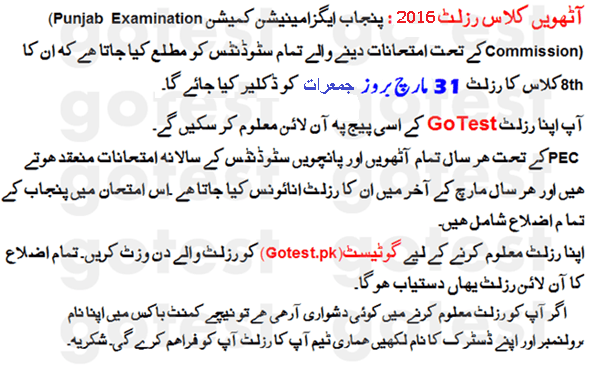 After conducting the examinations, PEC also announces the result within next two months. This year Punjab Education Commission (PEC) had conducted the annual examination of Science, Urdu, Mathematics, Islamiat and English subjects this year. Just like always, thousands of students had appeared in the annual 8th class examinations this year which had started from February 2019. All those students have been waiting desperately for their result so that they can seek admission in next class for further studies. The wait of all those individuals is finally over as the result will be announced in 31st March 2019. So do visit us back on the result declaration day as it will be available here immediately after its announcement by Punjab Education Commission (PEC). If you are facing any problem regarding checking your result, do let us know about it through your comments and we will provide you complete guidance for resolving the issue. Mubarik ho App Achy numbro sy pass ho gai hain.